A ministry of The Lutheran Care Network, Coburg Village is among the very best not-for-profit retirement communities in Rexford, NY. Our independent living center is committed to providing high-quality, non-denominational residential services and related programs for older adults. Our services extend to Saratoga Springs, NY, Albany, NY and beyond. The Lutheran Care Network is a ministry of healing, hospitality and community through partnerships in caring. It runs 11 senior care communities and services. TLCN staff is committed to the physical, emotional and spiritual needs of seniors. Their well being comes first. Coburg Village has a perfect combination of the old and the new. Our independent living center community opened in September 1999, but our roots gave us a rich 135-year history of service to seniors of all faiths. As a faith centered organization with a long history, the Coburg Village addresses the physical, spiritual, and emotional dimensions of the entire community with respect, compassion and goodwill. Our parent organization, The Lutheran Care Network, was founded as Wartburg Lutheran Services, but in late 2010, the Board of Directors voted to change the organization’s name to what it is today, TLCN. 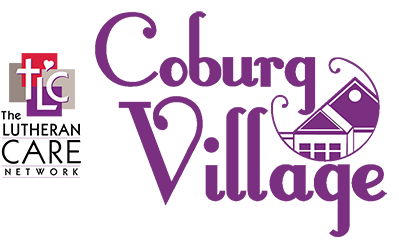 The secure and welcoming Coburg Village environment has always revolved around our residents’ physical, emotional and spiritual needs by encouraging an active and independent lifestyle. In support of that independence, a variety of services are available to all residents, provided by a caring staff that brings a wealth of experience and dedication to their work. We draw our name from the town of Coburg in Bavaria, Germany. It is an important region in Lutheran history, especially in the life of Martin Luther. The Coburg Fortress was built in the 12th Century to overlook the town and gave refuge to Luther when he was quarreling with the church. He remained there from April to October 1530. Coburg Fortress is one of the largest castles in Germany. Currently, it serves as a museum of arms, historical vehicles, coins, prints, and drawings.